Traditional Tudor fireplace mantel dated back hounders of years. This surround design was perfected decades ago and we manufacture it as an antique replica. The English surround is pictured here in beige sandstone. It looks great made from cast stone and limestone. 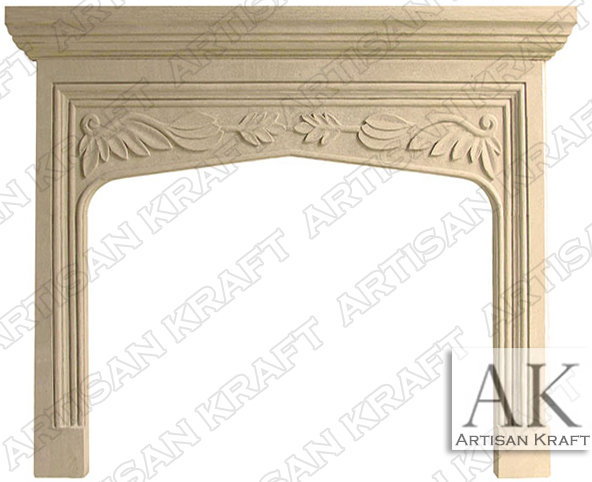 For a quicker lead time ask about our precast option for this Tudor style fireplace mantel. Leaves are finely carved into the frieze of the mantel shelf. Each step of the English Tudor Fireplace Mantel is perfectly proportioned. A hearth is fitted as well as inner panels if needed. We manufacture great restoration historic fireplaces. If you would like for us to replace you existing surround send us photos. Stone: Travertine, precast, limestone, sandstone, marble etc. Available in many different colors, textures and finishes.